Loco - Transport fruits & vegetables to Fruitopolis! A crisis is brewing in Fruitopolis! The new year's produce of fruits and vegetables is ready, but it now needs to be distributed to local grocery stores as quickly as possible! Thousands of fresh and juicy apples, pears, and grapes could spoil if they aren't transported in time! Trains will be passing through every town, headed for Fruitopolis Central. Fill them to the brim with fruits and vegetables for your friendly neighbourhood grocer! Good luck, you'll need it! Playing the game: To ensure that fruits and vegetables arrive safely and on time, fully load passing trains before they leave each town. Load train carriages by throwing the correct piece of fruit or vegetable in its corresponding slot. 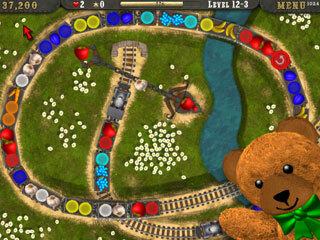 Launch your trusty claw to retrieve incorrectly placed items, and also to collect other bonuses from the train. Perform chain reactions and collect stars to increase your chances (and your score)!